Much like our shutters, color has a way of transforming a home. At Timberlane, we know colors are an important aspect of exterior design. From colors that have been woven into the fabric of history, such as Timberlane’s Antique Bottle Green and Country Red, to more contemporary ones like Slate Stone and Blue Topaz, we know you’ll find a hue that complements your home and your style. But we also offer custom color for shutters! 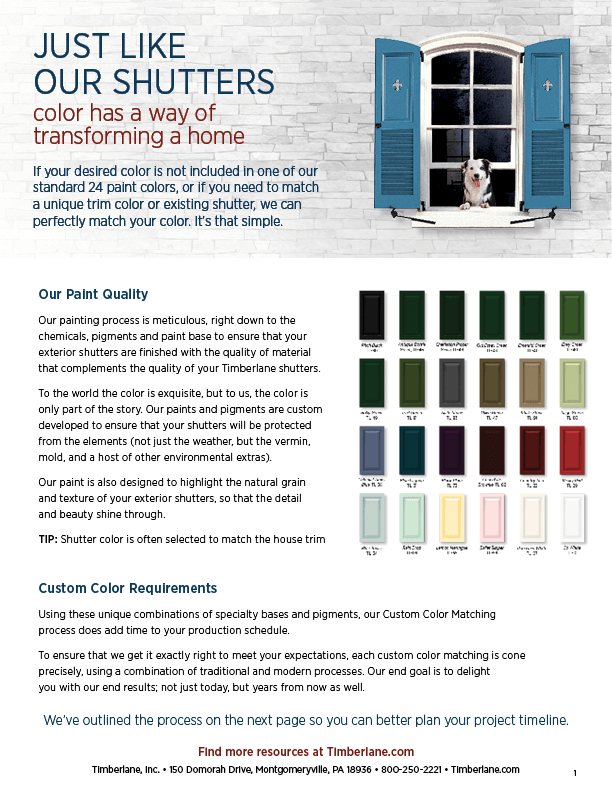 If your desired color is not included in one of our standard 24 paint colors, or if you need to match a unique trim color or existing shutter, we can perfectly replicate your custom color of choice. Just send us a chip or swatch of the custom color for your shutters and we’ll mix it up and send it for your approval. It’s that simple. Our painting process is meticulous, right down to the chemicals, pigments, and paint base to ensure that your exterior shutters are finished with the quality of material that complements the quality of your Timberlane shutters. To the world the color is exquisite, but to us, the color is only part of the story. 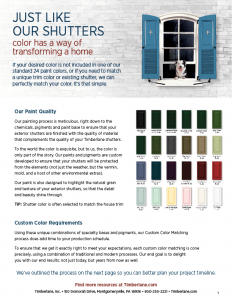 Our paints and pigments are custom developed to ensure that your shutters will be protected from the elements. Our paint is also designed to highlight the natural grain and texture of your exterior shutters so that the detail and beauty shine through. Getting custom color for shutters takes a little extra time. That’s because we’re committed to getting it right. The process of formulating unique combinations of specialty bases and pigments will push our expected date of completion back, so be sure to account for added time in your production schedule. To ensure that we get your custom color to perfectly meet your expectations, each color-matching is done precisely, using a combination of traditional and modern processes. Highly engineered to get the best match, we’ve been told that our services offering custom color for shutters are spot-on! Our goal is to delight you with our results – not just today, but years from now, as well. TIP: Shutter color is often selected to match the house trim. When your order is first placed, your shutters go into production immediately. As soon as we receive your custom color sample our process for color matching begins. Send us a color swatch. We do request that the size be substantial enough to allow for us to retain for our internal matching process (i.e. 3” x 3”, 6”x3” or larger). TIP: If possible, please send 2 swatches. Once we receive the swatch, we send it to our color mixing experts to have your color initially analyzed and a base point is created. The base color is then adjusted manually by developing the exact balance of pigment colors until the color match sample is correct. 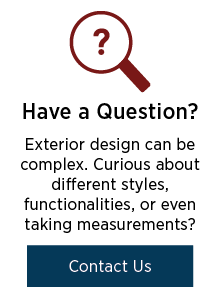 This process is long and exacting as the color must be reviewed in all light settings after the paint is dried, and then readjusted and repeated in tiny increments, from mixing to painting to drying to reviewing in different lighting, until the matching is exact according to lighting, visual and spectrographic readings, as compared to the original. When the color matching is complete, two sample blocks of the exact material type that your shutters are made out of are painted with the color and sent back to us here at Timberlane for our review. We then ship both the color sample block and a portion of your original swatch back to you for your own review and approval. Note: Our process timeline includes a 24 hour turn around for your review and approval. If additional time is needed it will add additional days to this stage of the timeline. After we have received your approval we will place the order for the required quantity custom paint for your shutter order. Our mixing experts will create your custom paint supply based on the final approved combinations and will retest and ship the custom paint supply to our location. 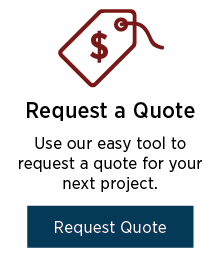 Upon receipt of the custom paint supply, we then schedule your shutters which have already been assembled and primed, into the production queue to be painted. After the first coat of paint has been applied we will match the color on the shutters with your approved color swatch before applying the 2nd coat of paint for an additional layer of quality assurance, and will then complete the painting process. Whether your shutters have received a custom paint color or a standard color, all of our painted shutters then pass through our final inspection, are packaged up and shipped to your location.